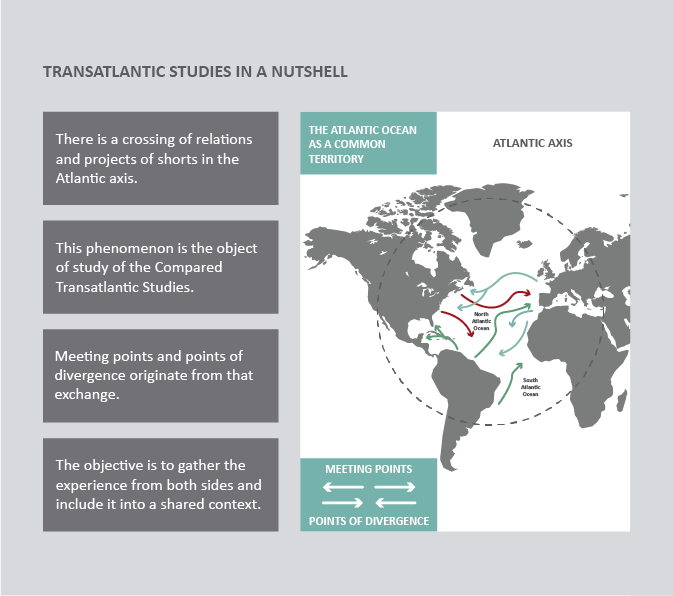 The objectives of the Transatlantic Studies are to observe and analyse the reality of the countries that conform the Atlantic axis from different perspectives, such as the political, economic or cultural diversity, by considering this part of the world a common space in which all kind of exchanges and relations are produced and in which all countries are linked in a way that the decisions of some can affect the rest to some extent. Similarly, the main objective of these studies is to achieve a better and deeper understanding of the general transatlantic context without missing the particularities, emphasizing the burning issues of our time. /cms/secciones/ajax/insertar_seccion/ /cms/secciones/ajax/borrar_seccion/ /cms/secciones/ajax/editar_seccion/ /cms/secciones/ajax/mover_seccion/ Are you sure you want to delete this section? 75874 You are about to cancel the edition. All your changes will be lost. Do you want to cancel and lost your changes?